When looking into great parenting books someone referred me to The Danish Way of Parenting and I do have to say, it is the best I have read up until now. What makes Denmark the happiest country in the world–and what are the secrets of Danish parents for raising happy, confident, succesful kids, year after year? This upbeat and practical guide brings together the insights of a licensed psychotherapist and a mom — a Dane and an American married to a Dane, respectively — on the habits of the happiest families on earth. Filled with practical takeaways and inspiring examples, The Danish Way of Parenting will help parents from all walks of life raise the happiest, most well-adjusted kids in the world. 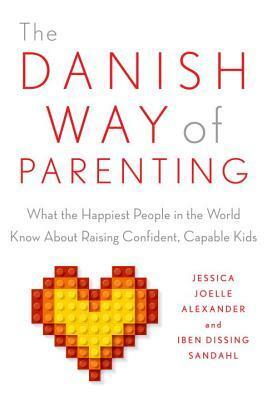 I give The Danish Way of Parenting: What the Happiest People in the World Know About Raising Confident, Capable Kids by Jessica Joelle Alexander and Iben Dissing Sandahl five out of five hearts. I loved the way the book was set up and it was easy to read. Using examples from both an American raised parent to a Danish raised parent, they explain how we as non-Danes could be more like them. I love the way they do things and I do plan on using this in the future. The technique they talk about is based on the keywords Play, Authenticity, Reframing, Empathy, No Ultimatums and Togetherness/Hygge. All explained, with examples and tips on how to use them. It seems easy to use, which is what some of these other books lack. Another difference I found with this book compared to some of the other parenting books I have read recently is that I felt comfortable with and agreed with everything in this book and not just most of it. Which was new to me and made me feel happy with it. Overall this book is the best I have read yet. I would advise every parent and soon–to-be-parent to read this and see what they can take away from it. Of course, don’t take all your parenting knowledge from just one book, but it is a great basis. Let me know what you thought of this book! If you have any requests for which book I should talk about next, please let me know in the comments down below. For now, let books enrich your life! This entry was posted in Book Review and tagged Book Review, Iben Dissing Sandahl, Jessica Joelle Alexander, Nonfiction, Parenting. Bookmark the permalink.